Uses mild electric pulses to Kill Many Microbes such as Bacteria, Protozoa, Fungi, and others. While these jars are not human or animal samples, it does very clearly demonstrate the ability of ParaZapper to quickly and completely destroy a very wide range of microbes. ParaZapper™ is an electronic device, Zapper, that kills microbes. For this reason, many individuals buy these devices, zappers, to safely kill or eliminate various potentially parasitic organisms. A technical leader in the industry has made significant improvements that make multi frequency Zapper the best zappers that you can find. Since the FDA prohibits ParaZapper™ from sales as a medical device, it is not marketed for use on humans or animals, such use is considered to be "off-label usage". This use is considered to be experimental as zappers have not been approved by the FDA or any other US agency for medical use. ParaZapper™ is and has been safely in use around the world for many years. There has been one zapper study published on the use of zappers and the results were positive, but the study had some definite limitations. The study was done before the introduction of ParaZapper™, so it was not included. There have been additional studies since the Thiel study that show effects of electric frequencies in shrinking and stopping cancer using electric pulses. There have also been many testiminials published but since the ParaZapper™ is not FDA approved, we can not post those on our website due to FDA rules and regulations. We can however, tell you about how happy many of our customers are at Zapper testimonials. With a 30 day money back guarantee and a 5 year parts and labor warrenty, ParaZapper™ is the right choice when looking for the best zapper. Order our excellent zapper instruction manual from paradevices.com (130 pages) no matter what zapper you buy. If something as big as a man can be killed with a lot of electricity, then why would we not be able to kill a smaller parasite with a little electricity? In her book, The Cure For All Diseases, Dr. Hulda Clark describes how certain parasites affect our health and how we can improve our health by killing them using a parasite zapper . Since this book was first published, many individuals have discovered that Hulda Clark zappers really do work. Zappers are sold by the thousands around the world , killing bacteria, protozoa, and other parasites. We offer several different zapper models and options to suit your requirements. Our Hulda Clark Zapper line is offered to provide better quality at best price. Yes, Stabilized output on all ParaZapper™ models. Dual Frequency = better results than any single frequency. We have several models of zappers sold around the world. The ParaZapper ™ Hulda Clark parasite zapper is popular, because it is easy to use, rugged, reliable, and inexpensive. Zapper based on Dr. Hulda Clark's latest parasite zapper circuit with improvements to make it more effective, including guaranteed positive voltage. Electronics are encased in durable, rugged ABS plastic. Smaller and light weight 0.5 lbs. Positive offset and no negative spikes as per Dr. Clark. Higher output with ParaZapper™PLUS you get a full 9 volt output instead of 7.5 that regular Hulda Clark Zappers produce. Even Stronger Output with Current Control adjustment (CCa) with ParaZapper™CCa you get a full 9.6 volt output, and adjustable current from 4 ma to 9 ma. Provides better results than even 12 volt units. Easy to use push button switches for power and frequency selection. Copper handles are soldered to instrument grade cables with lead free silver solder and work much better than wrist straps. Optional Copper Pad Electrodes provide a stronger signal due to increased contact area. Bright TriColor LED lets you know that the parasite zapper is working properly. With ParaZapper™PLUS and ParaZapper™CCa Yellow / Orange means that it is working correctly. Long Battery Life. Easy open 9 volt battery holder. Red Low Battery Indicator on ParaZapper™PLUS. Best instruction manual available according to users (sold separately). Satisfaction guaranteed zapper guarantee, 5 year Warranty on our products. 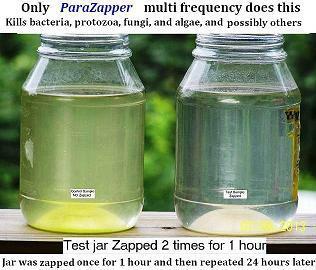 Be SURE that the parasite zapper you buy is a dual frequency unit ( 2.5 kHz is better!) and quality tested (preferably on an oscilloscope). What about zapper output frequency? In experimental testing, 2.5 kHz (2500 pulses per second) works significantly better than the 30 kHz suggested in Dr. Clark's book. as it provides deeper penetration. Dr. Clark recommends that you use the Hulda Clark zapper every two or three days as a preventive measure, since we are all constantly exposed to parasite eggs and stages in daily life. Notice! 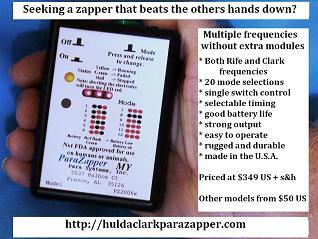 Hulda Clark Zappers are not FDA approved for use on either humans or animals and are not sold for this purpose. Warning! Do not use any Zapper type product if you are wearing a pacemaker or if you are pregnant. If you have metal stints in your heart this may cause problems, consult your cardiologist. Important! Zapping may have a negative impact on some metal prosthesis if the zapper touches your body, especially those made of stainless steel. These may contain Nickel and Chromium which can leach under electrical activity and cause tissue irritation. Over 90 percent of customers who responded to our surveys in 2004 state that the FDA should approve ParaZapper™ for use in the treatment of parasitic related illness. The ParaZapper™ parasite zapper is a professionally tested and guaranteed parasite zapper for a lifetime of trouble-free use. Order now using the buttons below. Your Card info is safe with our SSL secure server. We ship orders received by 10:30 AM the same day, others the next day, and will confirm your order details by email. We accept Visa, MasterCard, American Express, Discover, Money orders, Paypal, and Checks. Telephone orders are accepted also, just enter the information on our order page to save us time and call in your card number. NOTE: due to FDA requirements, zappers are not sold on this site. We have the phone ring to our home and will answer if possible. Visit The oldcoffeehouse.com for a range of information on health and other topics.